Winter has hit the Thompson-Okanagan. Snow is falling, ice is forming and my breath is evaporating in small white puffs in front of my face—but if you think that will keep me from adventuring outdoors, you don’t know me very well. I’m not immune to Canada’s cold. I catch a chill quickly and easily. I can’t deny the allure of staying inside, sipping a cup of steaming tea and curling up like a cat in a blanket. 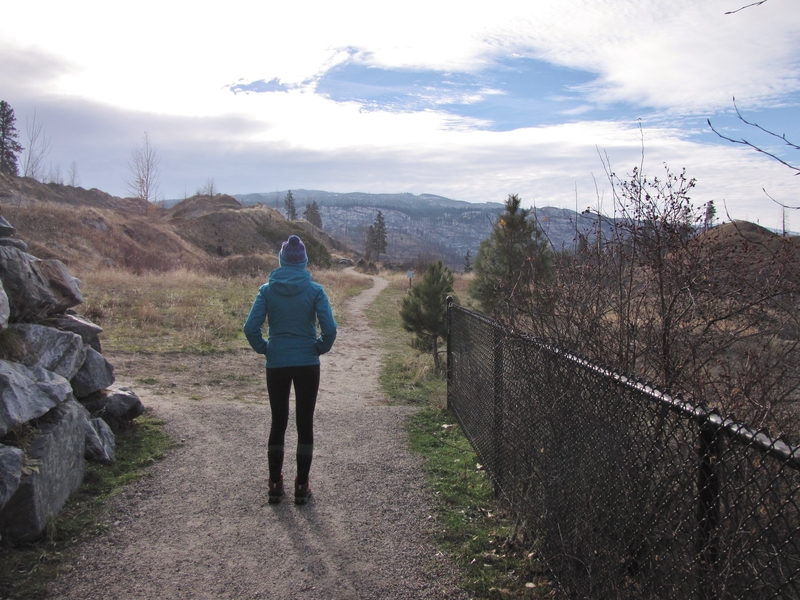 However, British Columbia’s outdoor scenery becomes even more secluded, stunning and rewarding to explore in winter. 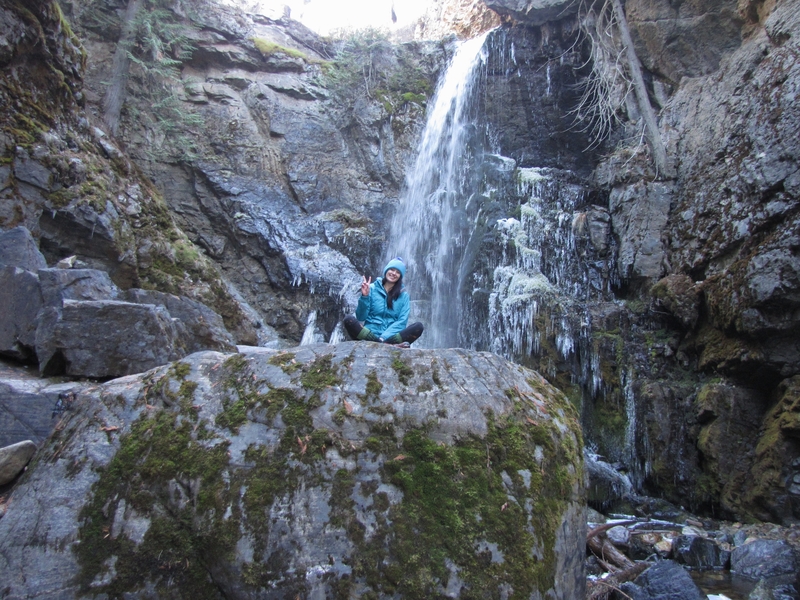 So, decked out in two pairs of long johns, wool socks and a toque, I set out to find two winter waterfalls in Kelowna’s residential area. 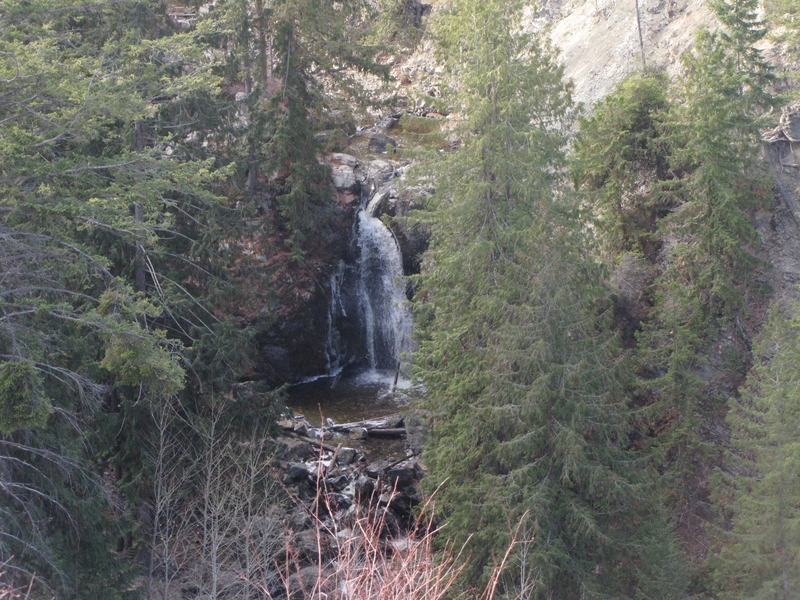 Crawford Falls is located in Southwest Mission. 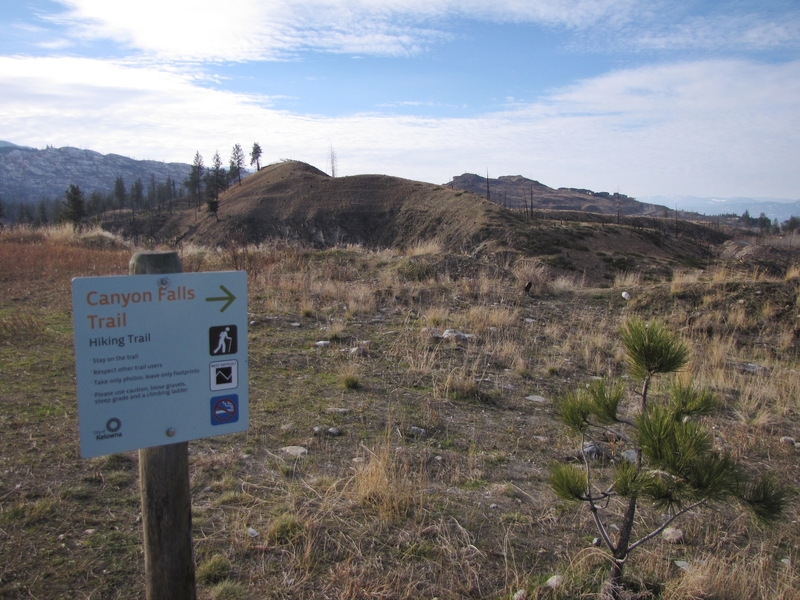 Also known as Canyon Falls, this hike is accessible through Canyon Falls Court, a small cul-de-sac with limited parking. 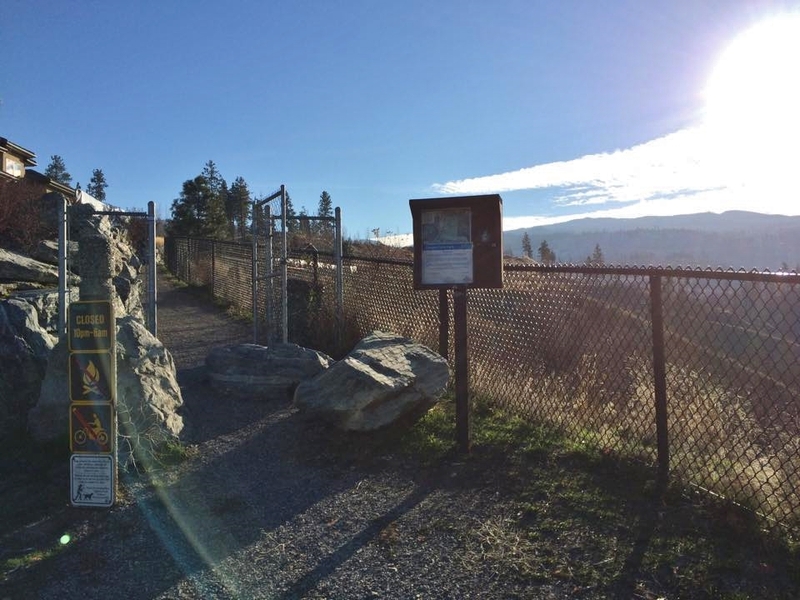 The entrance to the trail is quite obviously marked by a “Kelowna City Parks” sign. You can see the first falls from the upper trails, but getting closer becomes a bit of a quest. Ropes strung between trees help hikers maneuver their way down a sheer drop. 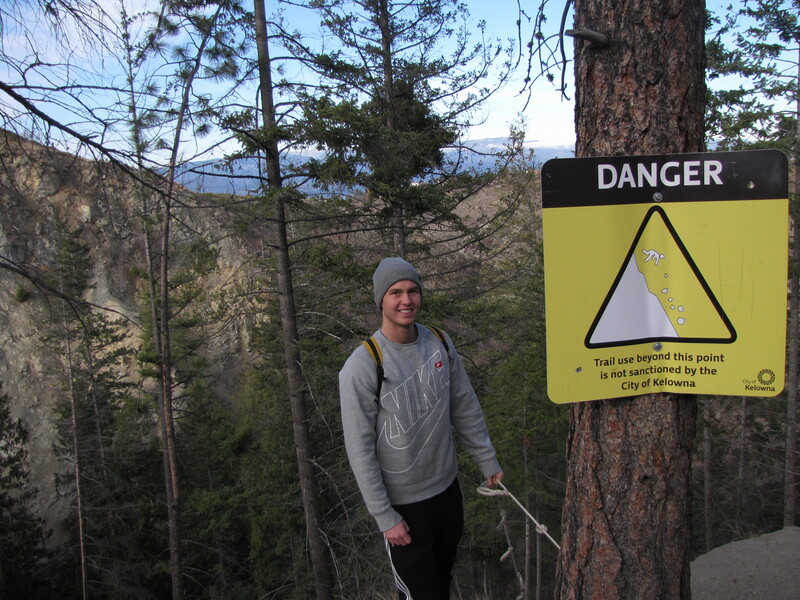 A large warning sign excusing the City of Kelowna from any incurred injuries marks the entrance to the rope descent. The City has recently created another, easier path that zigzags down the hill and incorporates a chained-up ladder. While it’s great to have this option, I still suggest taking the ropes if you’re able to. 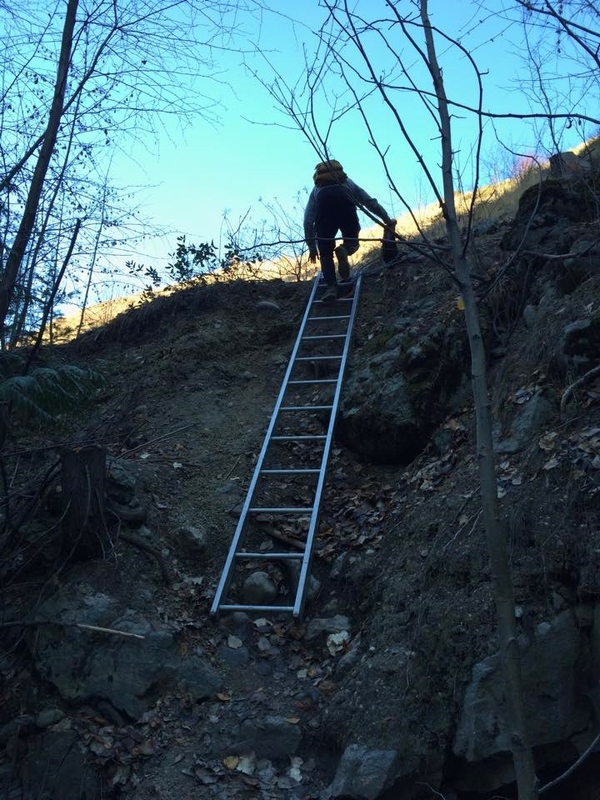 The route isn’t long, but it’s incredibly steep. When going down, face up the hill. Hang onto the ropes (it may help to wear gloves, especially in winter) and lean back slightly. It’s imperative to wear proper footwear. I had on Keen’s new Revel iii, which are meant for wet/winter hiking. This is NOT the place to wear flip flops! After about 20 minutes of heart-pounding descent, I arrived at the bottom. A thundering waterfall greeted me. Crystal clear froth slipped over jagged black rocks. Driftwood bobbed in the current, trapped between rocks in the shallow rushing river. 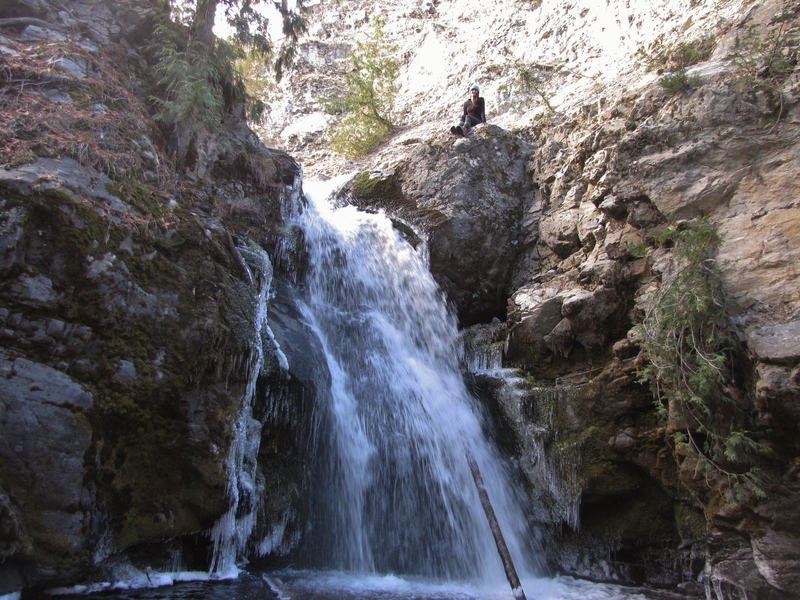 The waterfall stretched 20 feet high and a few feet wide. 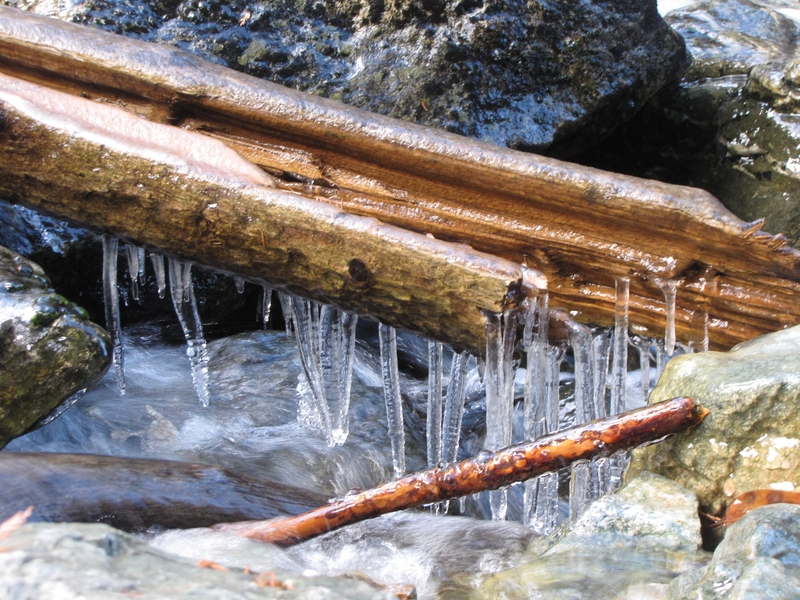 Icicles clung to wet rocks and logs. Nearby stones were dabbed with frost. The falls glowed an eerie blue. It seemed impossible that 30 minutes ago, I was standing in a city suburb. 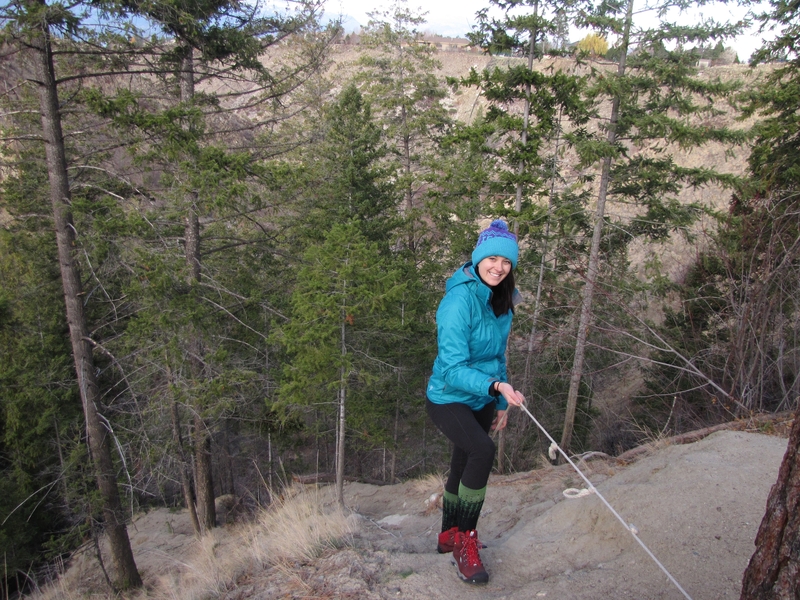 I hoisted myself over the rocks, taking care to avoid slippery sections. 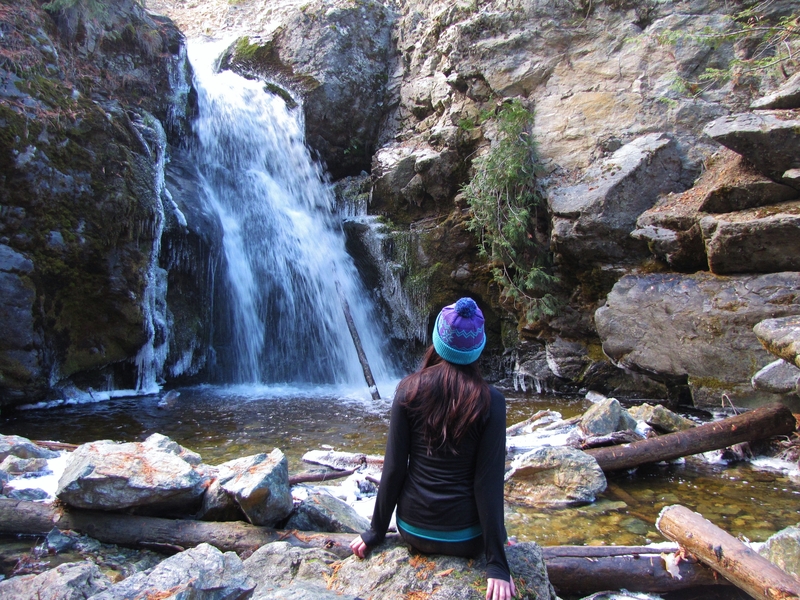 I climbed up to the far left of the waterfall. Once I was above it, I hopped from rock to rock to cross the stream and inched my way to the edge of the falls, dangling my feet alongside the cascading water. I crossed back over the river and kept walking up the path. After 10 minutes or so, I found the second waterfall. These falls were significantly taller, reaching about 40 feet and spewing out in a straight, thin line. 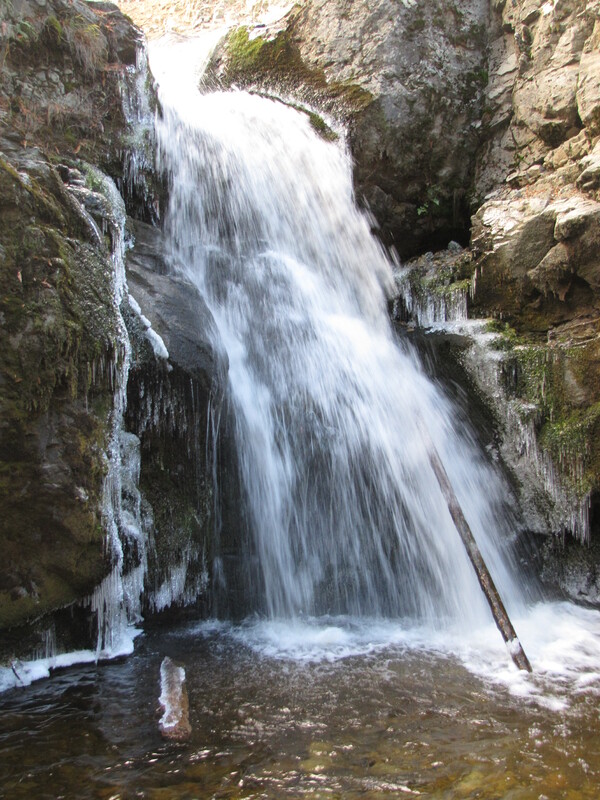 In the spring and summer, hikers can walk behind the falls and climb the cliff next to them, but in late November, it was far too icy to dare. Sunlight filtered down into the curved rock basin. Clumps of wet snow congealed at the bottom of the falls. I admired the rushing water from an ice-covered rock until my bum grew numb. Satisfied, I hiked back over the first waterfall and opted to take the ladder route back up the hill. Once on top, I took the “official” trail for about 10 minutes, staying to the right at any forks in the road. 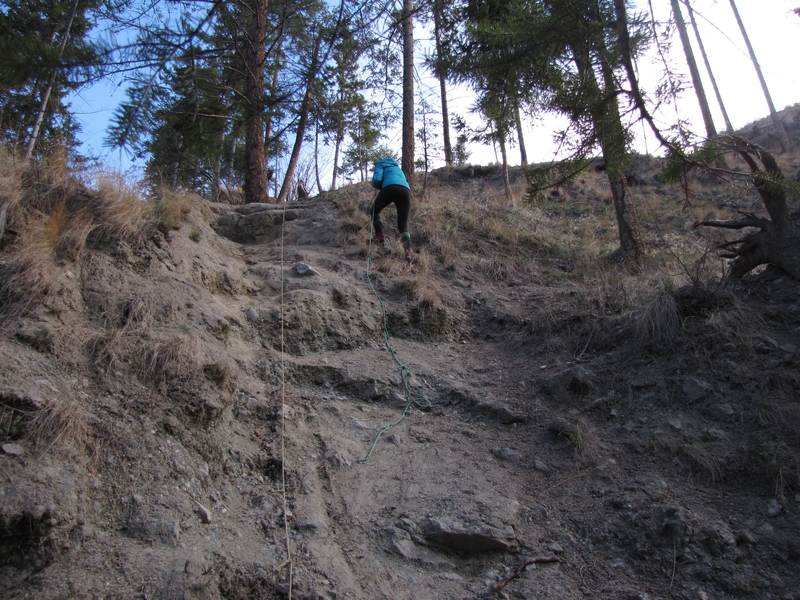 Soon, I arrived at another steep pathway equipped with ropes. This one was much easier to get down. I landed at the summit of the second waterfall. I stood as close to the edge as I dared, but the sudden plunge over the cliff was intense and nerve wracking. Unfortunately, the cliff-face next to the creek has been covered with graffiti tags. I found far too much rubbish lying around, left by previous hikers. Please, if you are choosing to enjoy British Columbia’s incredible nature, respect it. There’s a garbage can near the entrance, so pick up whatever leftovers you find to help keep this place beautiful. 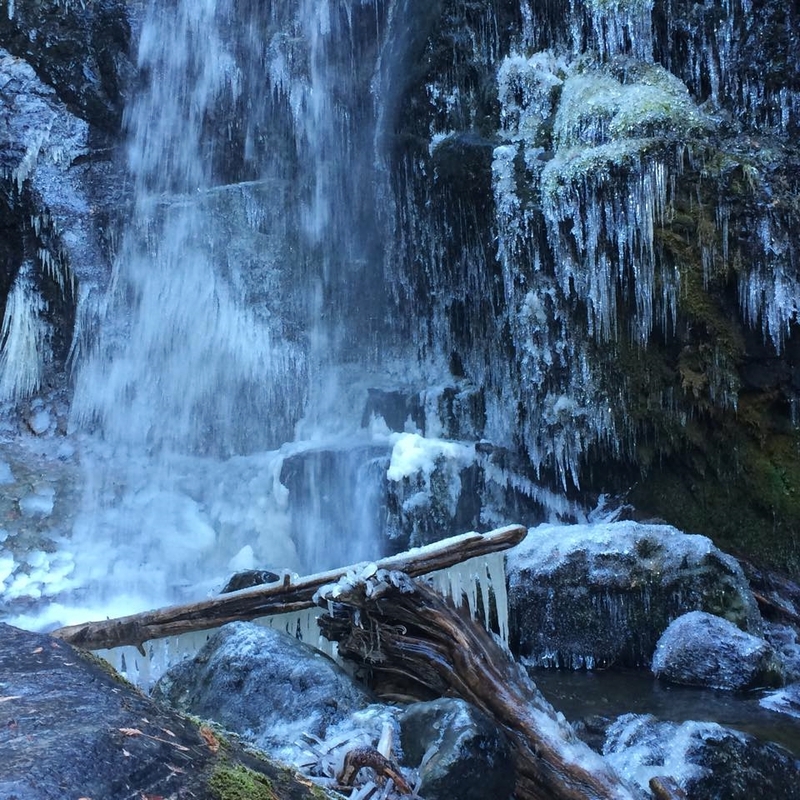 I’ve hiked Crawford Falls in the summer as well, but I can’t deny how much more beautiful the rushing water looked surrounded by crystals and blue frost. Don’t let the cold and snow keep you indoors—take a couple hours to get outside and fall in love with the world in winter. 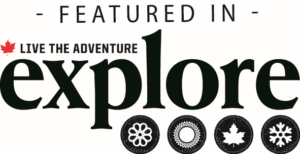 This hiking article was brought to you by our friends at Keen. Whatever outdoor adventures come your way, the Keen Revel III will help take you there.